Desc: Black Hills Gold Sterling Silver Dreamcatcher necklace. The Sterling Silver chain is rope link and has a spring ring clasp. The pendant is fashioned to resemble a spider web. The Rose Gold and Green gold feathers dangle from the center of the web. The two feathers dangle freely and move independently of the web. One green gold leaf is mounted above the two feathers. A Rose gold leaf is mounted on each side of the Green gold leaf. 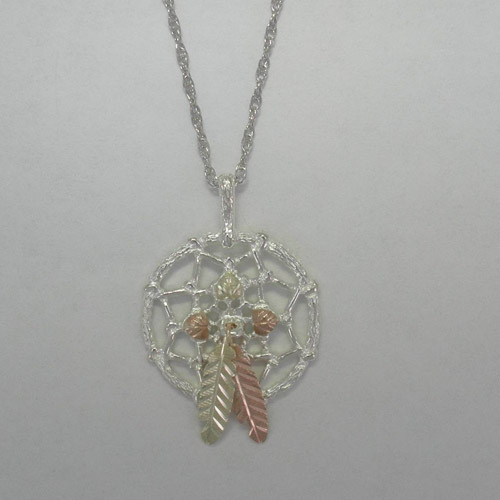 The Dreamcatcher necklace has textured and bright polish finishes. This necklace is made in the United States of America. 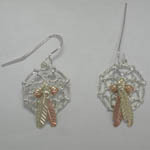 We have a matching pair of earrings, see SK1148.